Mazarrón is a municipality in the Spanish province of Murcia. Covering an area of 318 square kilometres the area also includes the town of Mazarrón which is set inland. On the coast is the popular beach area known as Puerto de Mazarrón and it is this popular tourist area which we focus on in this tourist guide. 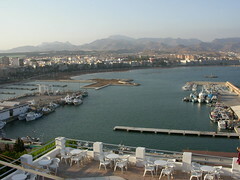 The Puerto Mazarrón is a busy resort and port located in the municipality of Mazarrón on the Costa Calida in Southern Spain. While the city of Mazarrón is located further inland. The closest airport is Murcia Airport which is a forty-minute drive away while Alicante and Almeria airports are an hour and forty-five minutes away. Puerto de Mazarrón dates back to the Carthaginian era of history and has a population of thirty-five thousand inhabitants and has a very good tourist infrastructure with hotel rooms, villas and apartments to rent as well as restaurants bars and nightclubs. The Puerto de Mazarrón is sheltered by the foothills of the Sierra de la Almenera and is blessed with a Mediterranean climate with more than three hundred days of annual sunshine and mild winters. Puerto de Mazarrón has an impressive thirty-five kilometre stretch of coastline with pristine beaches and coves and is also a haven for scuba divers. Puerto de Mazarrón beaches include the Playa Cabezo de Pelea, Playa de las Capas, Playa de Ballenato, Playa de Percheles, Playa de las Minas, Playa Parazuelos and the Puntas de Calnegre. The Costa Calida which translates as the hot coast has a fabulous range of beaches along the coastline stretching to the north towards Cartagena and to the south all the way to Aguilas which is the last resort before the Costa Almeria begins. The nearest golf course is located ten kilometres inland in Camposol, the Sensol Golf Course which is an eighteen hole course with the Sensol Resort Hotel just two hundred and fifty yards away. The top ten restaurants to dine out in the Puerto de Mazarrón includes 7th Heaven, Cerveceria Beldamar, La Bretanita, New Royal, Pizzeria, Restaurante Amapola, Restaurante la Proa, Restaurante Marina, Solsticio and Viggos Restaurant. British themed pubs and bars to spend an evening at in the Puerto de Mazarrón includes the Blue Moon Bar and Tel’s Bar 2. One of the most popular tourist trips from the Puerto Mazarrón is visiting Terra Natura in Murcia because of the water park and zoo or the Parque Aquatico in Vera on the Costa Almeria. Many tourists also like to spend a day at the neighbouring resort of Bolnuevo which is just a few kilometres away. The Puerto de Mazarrón is a family friendly resort and isn’t for lonely singles or groups who want to come to the resort to party. Puerto Mazarrón has a few hotels in which you can book a room for a night from as little as €36 a night and recommended highly by visitors to the resort includes the Hotel Playa Grande, Hotel Albaron and the Hotel Bahia. Budget accommodation can be booked from €30 a night at the Playasol, Pension La Venta, Pension Los Cisnes and the Casa Valentina. At the entrance to every Mazarrón hotel will be a plaque showing the hotel rating according to the Spanish tourist board. This is in the form of stars with a one star Mazarrón hotel being the most basic hotel standard in Mazarrón to a five star Mazarrón hotel being of the highest possible standard. One star hotels in Mazarrón are of a very basic standard. This will be the cheapest hotel accommodation in Mazarrón. Expect a dated decor and possible uncomfortable bed although the hotel room should be clean. Expect your Mazarrón hotel room to not have on-suite bathroom but a bathroom in the hallway which will be shared by other Mazarrón hotel guests. A one star Mazarrón hotel will have no facilities such as telephone or internet access. Our advice is to check the room first before you commit to staying. Avda. Constitución, 84 – 30870 Mazarrón, Spain. Two star hotels in Mazarrón are still of a basic standard and again will offer few facilities (if any). Again, if possible we recommend checking out the room before you make your hotel booking. However two star hotels in Mazarrón will be of a clean standard and safe so depending on your budget they are good value for money. C/ Carmen Nº7, C.P. 30870 Mazarrón, Spain. Calle San Juan, 7 – 30870 Mazarrón, Spain. Three star hotels in Mazarrón are the most popular choice of Mazarrón hotels as they offer clean, safe accommodation while being affordable to most people. Facilities in your hotel room will include basics such as telephone, hairdryer etc. The three star Mazarrón hotel may have a swimming pool for your use, a gym and internet access but do check if these hotel facilities are essential to you. The area fits all types of people. Camposol which is a large urbanization is mainly an ex-pat community but has Dutch, German, Italian, Spanish and French people here too. Mazarrón is a large area. With the exception of Camposol, the majority of people who live in Mazarrón are Spanish. Go-Karting, walking in the Sierra Espuna National Park (in the park you can also do quad biking, kayaking, parasailing, cycling, laser shooting, fishing), visit the GUNS in La Azohia, horse riding, use the natural hot springs, diving, sailing, snorkeling, local gyms. There are so many bars and restaurants in the area, especially in Mazarrón Town and Puerto de Mazarron where they have the new Marina. If you want a list, I will have to send this to you separately. There is a doctor and dentist on Camposol and in the main Towns of Mazarrón and Puerto de Mazarrón. There are several smaller villages close by. El Pareton, Leiva, Los Canovas, Bolnuevo. The nearest is in Puerto de Mazarrón and they are excellent. There are also other schools around that are not International that are very good. As in every area there is concern but I would not say it is an issue. There are always bank repossessions available but you have to remember that they probably would not have electricity and water connected which would come at an extra cost. Also normally no lights would be fitted, no white goods and no furniture. They always need extensive decoration. I would check our resales against bank repossessions to make sure you got the better deal. Camposol as described above but has no community charges, has a golf course and a wide range of bars, shops, restaurants, petrol station, doctors, market every Thursday etc. 70% of the properties owned on Camposol are lived in full time. Although during the summer we do have some holiday makers. Camposol is only a 15 minute drive to the coast of Bolnuevo and Puerto de Mazarrón. You have the Country Club which again is another urbanization but this is a gated community and has community charges. There is a communal pool, tennis courts and a bar. Local shops are Camposol and Mazarrón. Then you have Condado de Alhama which is a golf urbanization made up of apartments. How much are the typical property prices in Mazarrón for apartments, villas etc? Prices vary depending on how near they are to the sea. Apartments in Puerto de Mazarrón and Condado start from as little as 55,000 euros which do not have lights, furniture etc. Detached Villa´s in the area start from 80,000 euros up to around 900,000 euros. Any tips and advice to people looking to buy in Mazarrón or surrounding area? Always choose your area first. Spain is a large country and people do not really know where one place is to the next. Once you have chosen the area, visit it and take a look at a variety of styles of properties that suite your requirements and budget. Location is always something to be considered if you want to be within walking distance of amenities or a short drive, how near the beach if you want to be coastal etc… We at Luz del Sol ask a whole host of questions to our potential clients to ascertain their requirements so we can show them properties that match their wish list. We do not want to waste their time, the vendors or ours showing them something that does not fit. Pamela, thank you so much for taking the time to help our readers with your experiences in Spain. If you want to contact her, you can find her details below. Opening Hours: Open Monday to Saturday 09:00-14:00 and 17:00-19:00. Closed on Sunday and in winter. Below we have an interactive guide and map of Mazarrón for visitors and tourists visiting the town of Mazarrón on the Costa Calida coast of Spain. This free Google map of Mazarrón can be used in many ways: as a streetmap of Mazarrón, as a map of Mazarrón hotels, as an Mazarrón apartment map, as a way of getting driving directions to Mazarrón or as a map showing the main tourist attractions and sights in Mazarrón. Where is Mazarrón located in Spain? What is the nearest airport to Mazarrón? How do I get to Mazarrón? Where can I find driving directions to Mazarrón? Where can I find a free streetmap of Mazarrón? Where can I get a hotel map of Mazarrón?